This month I decided to finally take that cake decorating class that I had always dreamed about. A friend of mine suggested I check out the affordable classes offered at Michael's Arts and Craft stores. It turned out that all classes were 50% off for the month, so I signed up quickly and started buying the required equipment and supplies. While I pictured the class being all flowers and sunshine, it actually turned out to be a bit of work too. 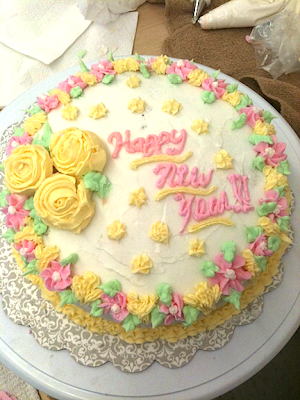 After four weekly two-hour classes, and lots of at home prep and clean-up, I am happy to report that I now have a pretty good beginner's knowledge of cake-baking and decorating. Below is sample of my work-- our final class project. I look forward to learning more techniques and developing my skills further in the future. This Christmas I had my first turducken. 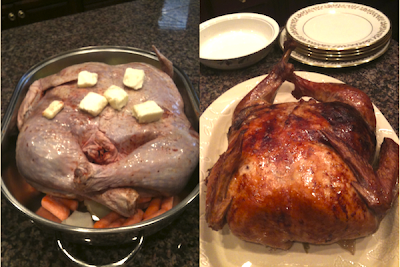 A turducken is basically a de-boned chicken, stuffed in a de-boned duck, stuffed in a de-boned turkey. This one was pre-made and available at a local market. It was a beauty. They even managed to fit some sausage stuffing inside there. Here's a little history on the turducken's origins.